Please join CILA and Hasting Race & Poverty Law Journal for its CLE presentation and webinar on March 13, 2018 from 12pm - 1pm. 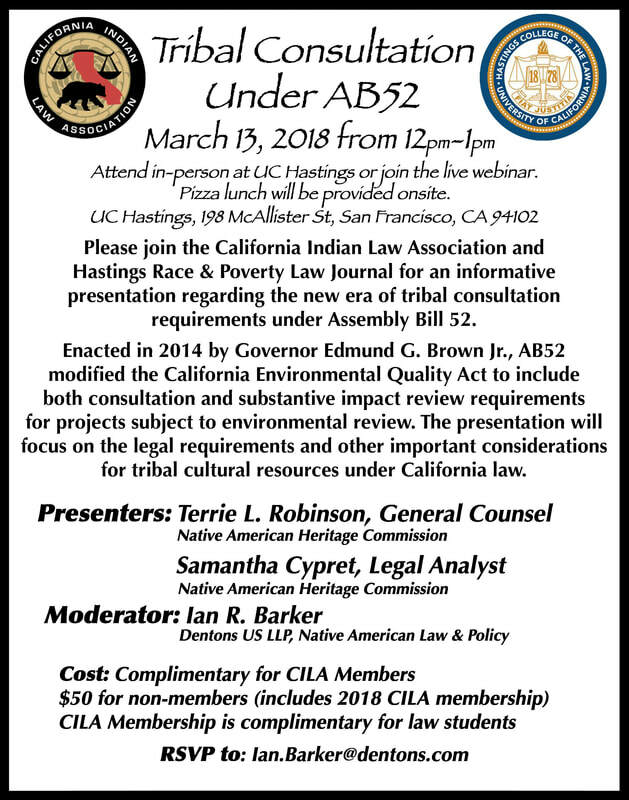 ​The webinar is titled “Tribal Consultation Under AB52,” and will feature a discussion with Terrie L. Robinson, General Counsel for the Native American Heritage Commission, and Samantha Cypret, Legal Analyst for the Native American Heritage Commission. Registration is free for CILA members and law students. Non-members may register for $50.00. The $50.00 registration fee includes CILA membership from October 2017 to October 2018. CILA members, please complete Step 1 to register. Non-members, please complete Step 1 and Step 2 to register.